I discovered these buns when trying to figure out what to do with my last 1/2 cup of coconut milk (I can't throw ingredients away unless absolutely forced). The recipe makes the lightest, fluffiest buns, slightly sweet, and amenable to all kinds of fillings. One suggestion is a filling made from coconut, sugar and butter (yes please! 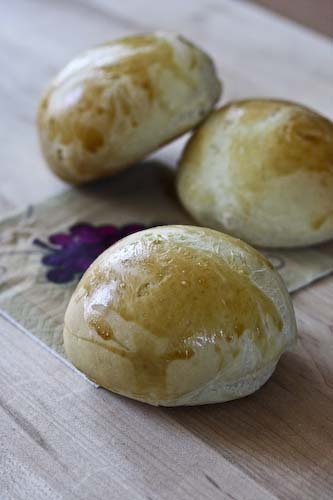 ), the kind of sweet buns you might find at a Chinese bakery. But I have to tell you, slathered with a little butter, dripping with honey from the farmers market, and you're all set. Plus, they really only require one rise, you can leave them alone for the second time while the oven pre-heats. The original recipe calls for blended bread flour, which, evidently, has a higher percentage of protein, which helps to build the structure of the bread. But I didn't have any and didn't really want to find any, so I used all purpose and all was well. Dissolve the first teaspoon of sugar in the 1/2 cup warm water, then sprinkle in the yeast. Allow to bloom for 10 minutes before stirring. In the meantime, warm both kinds of milk in a flame-proof bowl or saucepan until luke warm, stirring all the while. Stir in the butter, the 3 tablespoons of sugar and the 2 teaspoons of salt, as well as the 1/2 cup warm water. Take off the flame, making sure that the milk isn't hotter than luke warm. Then add in the yeast and 2 cups of the flour. A whisk comes in handy hear to beat the dough until starts to become smooth and elastic. At this point, I switched to a wooden spoon and added in about 2 1/2 more cups of flour. Continue to beat until the dough starts to come away from the sides of the bowl. Turn the dough out onto a lightly floured surface and kneed. I kneaded the extra 1/2 cup of flour into the dough, as well as a bit more. Continue to knead until the dough is smooth, elastic and no longer sticky. Place the dough in a large, greased bowl and turn so that all sides of the dough are greased. Cover with a towel and allow to double in size, about 1 1/2 hours. Preheat the oven to 375F. Punch the dough down, then divide in half, and in half again, and again, until you end up with 16 dough-sections. Roll each section into a bun between the palms of your hands and place on greased baking sheets. 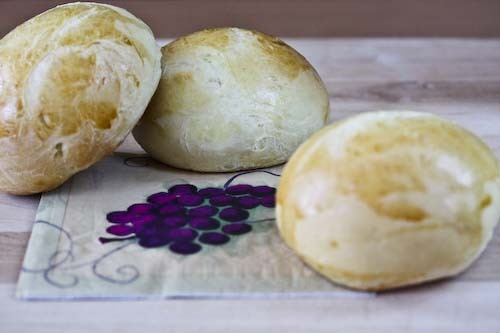 Brush with the beaten egg wash.
Bake for 18-20 minutes, until the buns are a golden brown and sound hollow when tapped on the bottom. Transfer to cooling racks, and enjoy. I'm sending this post over to Susan at Wild Yeast for the weekly Yeastspotting. It's been so long! Wow coconut in the buns, looks georgeous & interesting. I really like the sound of using coconut milk in the rolls! Since I don't have to work today, this is the perfect time for a new baking recipe to come along. Thanks for giving me a new recipe to try. Andrea, no kidding. I am bookmarking this and hoping to make it soon. Love coco milk! These may soon find a place on my table. You always have the best buns! So glad to have you back at YeastSpotting. I love the idea that you didn't want to throw the rest of the milk and used them for making this dleicous buns. They'd probably be good with a red bean filling too! They look great! 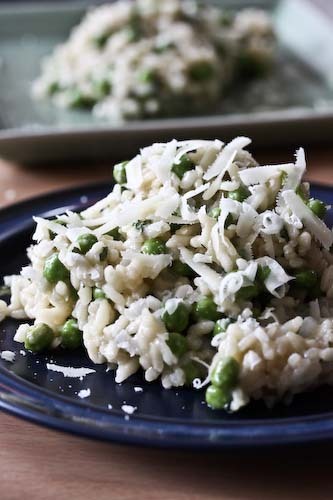 These look terrific and what a great use for a leftover quantity of coconut milk. I appreciate a fellow food saver- I always find myself leftover with half a can of tomato sauce of coconut. Great way to use it up- they look great too! I do the same thing with leftovers...force of habit I guess. These darling buns are the reward for that. They looks rich and light and delightful! I like the filling idea, too. Even had King's Hawaiian bread? The recipe for this very popular and super sweet bread appears to be closely guarded, but my experiments have revealed that its essence may be coconut milk and pineapple juice! Duh. Try subbing some pineapple juice in your recipe for the plain milk and see what happens - IMO, there's no need to make these super sweet. A very healthy bread!i love it! This means that you actually burn fat by eating Coconut Fats (also coconut milk, coconut cream and coconut oil). These 3 studies from major medical journals are sure to turn the traditional nutrition world around!